As evergreens, cedar trees keep their needles and color all year long. To add another layer of color and texture around the cedar tree, plant a vine. Because the cedar tree casts dense shade to the garden below, vines must have the ability to withstand some shade to thrive in the soil below. Tucked under the cedar tree, a flowering vine helps to add color to the garden for a showy display. 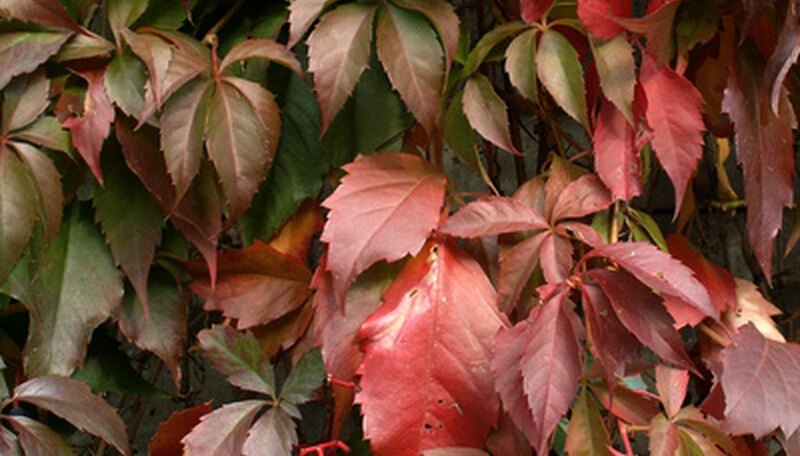 Boston ivy (Parthenocissus tricuspidata) is a rapidly growing deciduous vine with course texture. With its ability to grow in sun and shade, Boston ivy thrives under large trees like the cedar tree. Like the cedar, Boston ivy grows in a wide range of soil varieties and withstands adverse weather conditions. Growing 30 to 60 feet long, Boston ivy is a large vine variety with strong tendrils that easily adhere themselves to nearby surfaces, like a tree trunk. The dark green leaves of Boston ivy turn to burgundy every fall for a brilliant contrast to the green cedar tree. Boston ivy vines prefer moist soil to thrive. Plant Boston ivy in USDA Hardiness Zones 4 to 8. Five leaf akebia (Akebia quinata) is a deciduous to semi-evergreen vine with a rapid growth rate and twining climbing method. Five leaf akebia thrives in moderate shade and sun, making this the ideal vine to grow under the cedar tree. Adaptable five leaf akebia is low-maintenance and grows in ordinary soil types, making for an unfussy vine. Growing 30 to 40 feet long, five leaf akebia vines have small, fragrant flowers that are red to purple. The blooms of five leaf akebia light up the landscape with color in mid-spring. The foliage on five leaf akebia grows in clusters of five leaflets to create a mass of green leaves once established. Plant five leaf akebia in zones 5 to 8. An evergreen with a slow to medium growth rate and fine to medium texture, wintercreeper (Euonymus fortunei var. radicans) retains its foliage and bright green color all year. Like the cedar, wintercreeper remains vibrant through the winter to provide a constant source of brilliant color to the landscape. Growing 5 to 15 feet long, wintercreeper is often grown as a ground cover. The oval-shaped foliage on wintercreeper is dark green with toothed edging. Wintercreeper thrives in both shade and sun and requires a medium amount of moisture. Plant wintercreeper in zones 5 to 9.